At Quickplans we use our 21 years of extensive experience in the architectural industry to help provide the best services to our clients. Based in Mauchline, we are ideally placed to reach surrounding areas of Ayrshire including Kilmarnock and Ayr. The company is owned and managed by qualified professional Jack Bingham who holds BSc (Bachelor of Science) and CEng (Chartered Engineer) qualifications. He is also a dedicated member of M.I.C.E (Member of the Institute of Civil Engineers), giving you peace of mind that any work carried out is of the highest standard. If you require another service that isn’t listed here, do not hesitate to get in touch. You can call on 01290 552755 or fill in our online contact form. 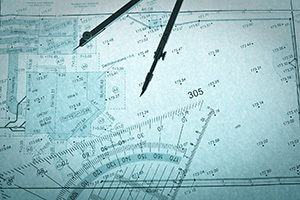 Securing a planning application for a building project can sometimes be a hard task. There are many things that must be taken into consideration when drawing up plans, including water mains and drainage, legal position, planning history, listed building protection, conservation areas, scheduled monuments, and more. Planning permission is required in Scotland for any new development and this includes buildings, engineering, mining, or other operations either above, over or under land. Changing the listed use of a building also requires planning permission. It is however not needed for work that only affects the interior of a property, as long as it is not listed. If you need architectural services in or around the Kilmarnock and wider East and South Ayrshire area, then please get in contact with us. We have extensive knowledge of planning regulations and building design, giving you reassurance that your projects will be fully compliant with regulations. You can call us on 01290 552755 today or fill in our online contact form for further details. Take a look through our services page to see what we can offer you from our wide range of services!